At the moment, in my last post, when I spoke up at the Boston BRCA conference and broke down about my daughter’s BRCA fate worry, is where my connection with Lauren Corduck began. 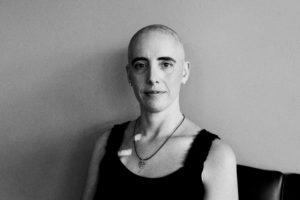 Lauren Corduck stood out at the Looking Back, Facing Forward 2017 conference as she boldly walked in with her bald head. She was also noticeably dressed like a Boston millennial in a dark bohemian-ish dress, topped with a hip, short-waisted jacket. Lauren was a woman on a mission, so I admittedly wondered what her story was. Lauren was a mom of two young children, and new to her town, when her lower back pain appeared in the fall of 2016. After the typical, multiple visits to physical therapy, acupuncture and chiropractic bodywork, no relief was found. Her father suggested an MRI, which Lauren, in turn, had to convince her doctor to set the imaging appointment. It wasn’t until a friend suggested Genetic Counseling upon hearing of Lauren’s family history of breast cancer combined with her heritage, that she discovered much more than just the reason for her growing, debilitating back pain. First, she found out that she had a 1 in 40 chance of being positive for a BRCA genetic mutation just for being an Ashkenazi Jew (i.e., a Jew of central or eastern European descent). ONE in FORTY. This means that out of 40 Ashkenazi Jews together in a room, 1 will be affected. I remember hearing the 1 in 40 statistic for people of Ashkenazi Jewish descent during my genetic counseling appointment and was baffled by the injustice of a high probability of cancer for this entire ethnic group. Not only was Lauren told that she did have a mutated BRCA1 gene, but the New Year’s Eve news gave her up to a 54% chance of developing Ovarian Cancer. Remember the MRI, that Lauren insisted upon for her immense back pain? Well, it may have saved her life, revealing an incidental finding of enlarged lymph nodes in her groin area. Further tests revealed that Lauren had Stage 4 Ovarian Cancer–a disease with no screening, and as a result, low survival rates. Her cancer had metastasized to her lymph nodes as high as her collarbone! See BRCA102 for additional information and resources. Noticing changes in your body and taking action like Lauren did are imperative, along with gynecological exams and knowing your family history. It cannot be stressed enough the importance of taking charge of your health and pushing for further testing if the answers that you’re hearing from your doctors don’t feel right. After all, you know your body better than anyone. During the Boston BRCA conference when the topic of possibly passing the BRCA1/2 gene mutation on as a legacy arose, Lauren and I individually spoke about how both of our daughters responded with concern about their own futures when they learned of our BRCA news. It was unexpected and heartbreaking for each of us as mothers. Lauren and I are not just connected because we cried at the same moment during the conference, have daughters, are BRCA positive, and created websites to spread BRCA awareness, but we bonded because of…all of it! Who do you know, who needs to know about the One in Forty statistic? How do you monitor your own reproductive health?